When packing for multiple-day hikes, you need an effective backpack. It should have lots of storage space for your extra food and camping gear. If lucky, you could squeeze in a bear canister or two. The ULA Catalyst backpack allows this and much more. 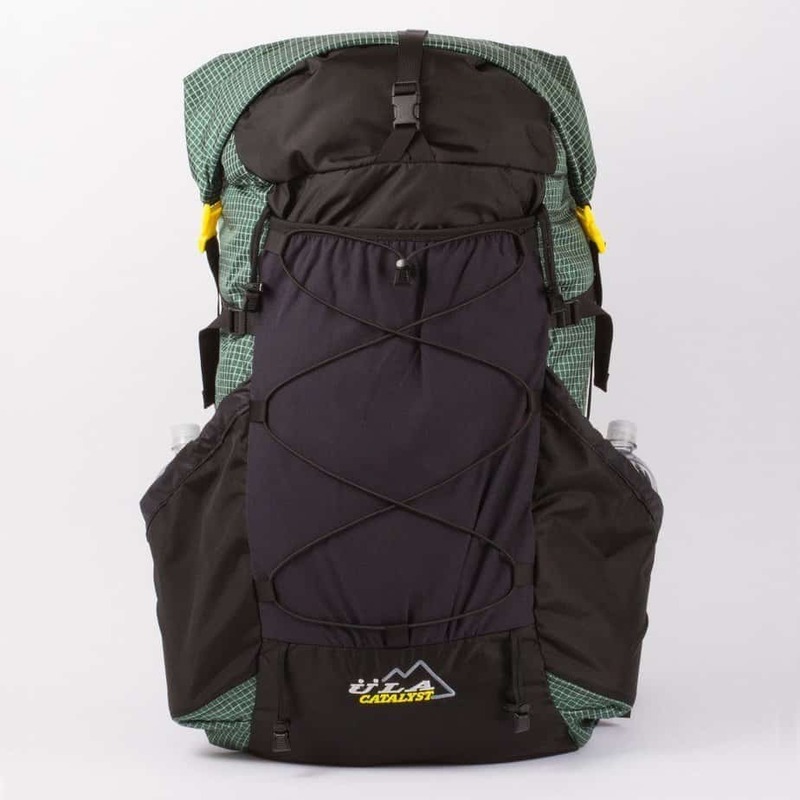 As the largest capacity backpack in the ULA line, the Catalyst features a storage space of 75liters. It holds loads of up to 40lbs without compromising comfort and durability. Apart from that, the backpack is feature packed for your convenience. 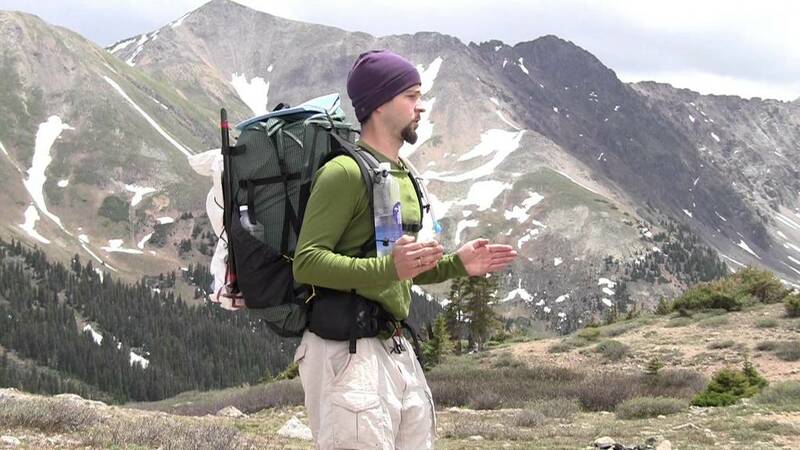 The ULA Catalyst backpack is a common sight among Pacific Crest and Appalachian Trail hikers. Backcountry guides also find it necessary for their extra equipment storage. However, what makes it a hack for all your thru-hikes, mountaineering expedition and weekend warrior lifestyle? 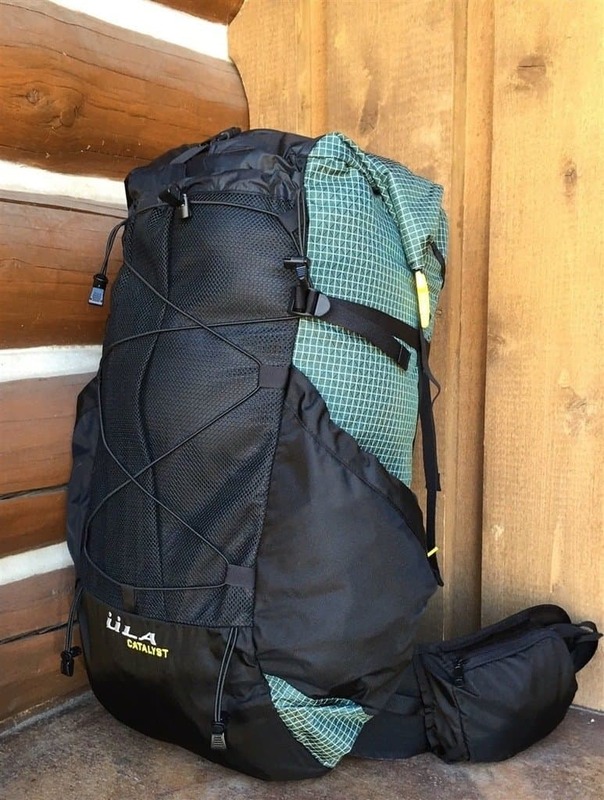 Well, to help you understand here is an in-depth review of the ULA Catalyst backpack. Snugs tight on your back for easy movement. Not ideal for straight trails. You have to lean forward for proper posture. There is plenty of room in the ULA Catalyst backpack. Aside from the main compartment that features an extended roll-over sleeve, you get two large side pockets, a rear mesh pocket with compression straps and two zippered hip belt pockets. Other terrific storage add-ons are the interior clip-on stash pocket and hydration sleeve. The main compartment has a storage capacity of 42.6L. This space is large enough to haul a BearVault BV500 horizontally or vertically without eating much into your space. Stashed inside also is a removable utility pocket great for holding your keys and wallet. Instead of having a big lid and a porch on top, the ULA Catalyst cuts down on weight significantly by just having a roll-top lid. The extended collar is pretty big with a maximum volume of 9.8L. So in case you have to overstuff your pack, you get extra room. Once packed, you can either cinch down the roll-top to the side straps or buckle it up like a dry bag. The attached top strap helps you secure down your sleeping pad on top of the roll-over sleeve. The front of the backpack has a big mesh porch with a shock cord to keep things snug. It’s great for keeping items that you need quickly like your rain gear or your tent flyer. The compression straps also allow you to drip dry your wet jacket while on the go. When the main compartment is not completely stashed, the mesh porch allows 9.8L of storage space. However, when full, it limits space and makes it hard to get items in the pouch. The ULA Catalyst has two sizeable easy-to-reach side pockets that are great for holding water bottles or tent poles. They also feature compression straps for better grip. The side-pockets allow a maximum volume of 5.7L each, though this volume reduces significantly when the pack is full. The backpack also has great side pockets on the hip belt. They are an excellent place to store your camera, batteries, sunscreen and the day’s snacks. Together with their 1.6L storage capacity, the ULA Catalyst has a total storage volume of 75.2L. Most backpacks in today’s market feature internal frames. Internal frames offer easy maneuverability, especially on off-road tracks. These backpacks hug your body tightly almost as if they were part of it. The ULA Catalyst features the same design with few adjustments. It comes with a fairly beefed up internal frame that hides away in the lumbar pad also responsible for holding the hip belt in position. ULA Catalyst’s standard frame sheet consists of two dense foam panels with two aluminum stays stashed inside in a V-shape. These foam panels prevent pointy objects from poking through the backpack. They also hosts the two aluminum stays. The stays bend to contour the frame sheet to your spinal curve. They are flat sided metal poles that come pre-shaped. You can remove them and bend them further for a tailored fit. This gives you an excellent back grip for a lowered center of gravity and proper weight distribution. Bending your stays also majorly improves the fit of your hip belt. In case you have a hard time doing so, try contacting ULA customer service for professional help on how to go about it. The twin stay frame sheet is also built to withstand loads of up to 40lbs. Within the load range (32-40lbs), the frame sheet offers unmatched stability and load control suited for on and off trails. The pitfall of the internal frame design is that it forces you to lean forward for proper balance. This can be tiresome when walking for long on straight paths. Also, the internal frame limits air ventilation on your back. If you tend to sweat a lot, you might want to stop now and then for a back breather. Bottom-line, ULA Catalysts twin stay frame sheet offers the stability need to tackle complicated tracks. However, lack of proper air circulation makes its unrealistic for summer hikes. The ULA Catalyst shoulder straps feature a padded spacer mesh that is cushy but not too soft. It contours well to your body shape. These straps are sewed in place at the top and bottom of the main compartment. The bottom straps come out through a small hole on both sides of the side pockets. The Catalyst shoulder straps feature an adjustable chest belt that eases pressure off your shoulders. This sternum strap is on a slider and can be moved up and down to the place most comfortable on your body. If the strap is twisting in, then you are probably pulling it too tight. For a fine grip, you can adjust the shoulder straps using the top load lifter adjustments or the lower straps. If the hip belt comes up, you may be pulling the straps too tight. Here is an illustration from ULA backpack team on how to properly dial your ULA Catalyst into form. Instead of stashing your water bottles on the side pockets, try making use of the shoulder straps adjustable dual shock cords design for carrying water bottles. They counterbalance the weight load on your back and are an easy-to-reach option for your hydration needs. The Catalyst shoulder straps are available in two options: the J-straps and S-straps. Each design caters to certain body shape. The J-shaped strap is the original design endorsed by ULA and ideally meant for men with an average build. The S-shaped strap caters to a variety of body shapes especially women with unique body figure for more comfort around their waist, shoulders, and bursts. Men with strong square shoulders such as swimmers, weightlifters, climbers, surfers, XC skiers, and triathletes also find it a great pick. Both ULA straps are customizable at free of charge. So in case you have a massive upper body with a little torso, you might consider going in for a tailor fit shoulder strap. For more details on the ULA Catalyst shoulder straps options watch this video. The ULA Catalyst shoulder strap features are usually far within its price range. They are mostly adorned by high-end expedition or custom backpacks. ULA is one of the few lightweight backpack makers that customize almost everything to your size. Their hip belt is no exception. It’s available in multiple lengths ranging 26’’ to 42+” regardless of your torso length. 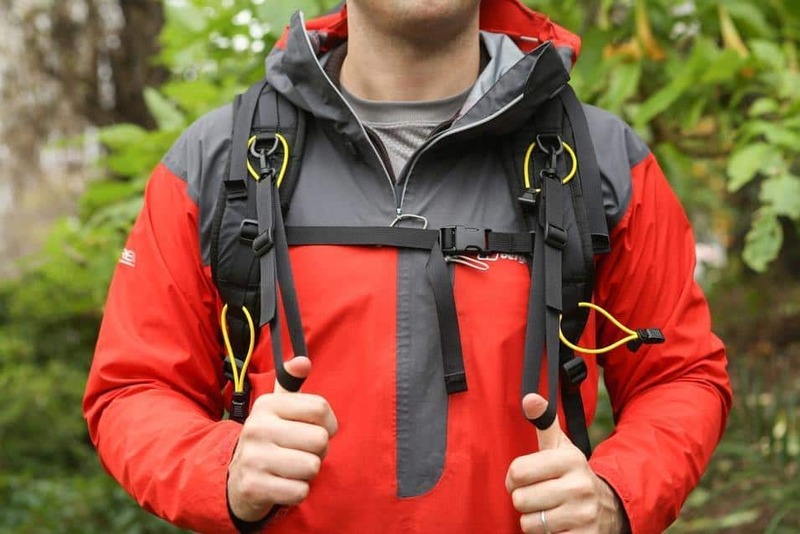 The hip belt sits at the lumbar pad of your pack frame where it attaches with a Velcro. You can raise or lower the hip belt to customize your torso length. Simple detach the Velcro and move the hip belt 2’’ up or down to reattach. This feature is particularly helpful when your pack is full, and you need to readjust the belt for a perfect load to hip weight transfer. The hip belt cinches down the waist using two straps on both sides. Each strap twists in the middle to form a top and bottom tension straps. The top and bottom tension straps allow you to customize the belt for a perfect fit further. Your luggage tends to sway sideways when carrying extra weight. You can tumble as a result of the constant sway. As a prevention mechanism, the Catalyst features hip control straps on its hip-belt sides. 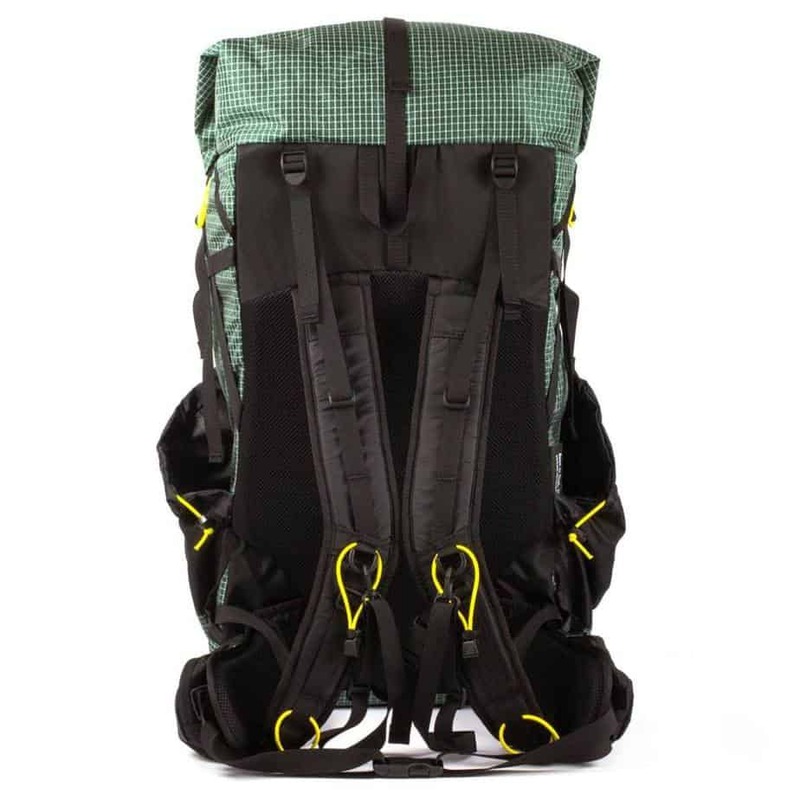 These straps pull the pack base closer to your back for more stability as you move. For a backpack of its capacity, ULA Catalyst’s weight can be overwhelming especially on your shoulders. 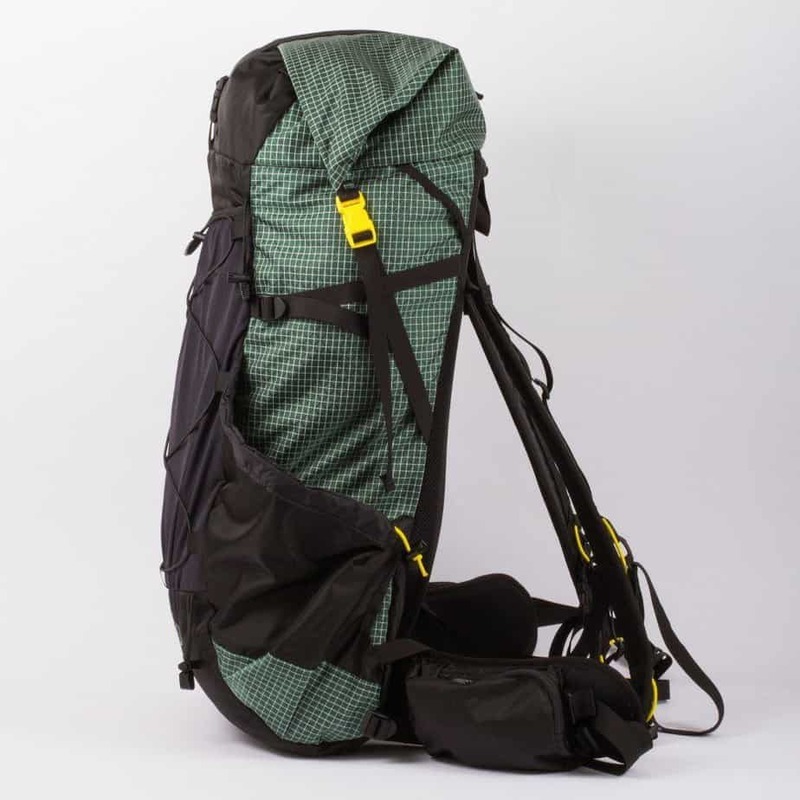 To regulate the weight, the pack comes with detachable hand loops. The hand loops fasten to the D-rings on your shoulder straps. The hand loops weigh less (0.8oz) and would be an insignificant weight adjustment to your pack. The ULA Catalyst hydration sleeve fits water bladders of about 3liters. It’s a great option if you don’t mind carrying your fluids inside the main compartment. For easy access, the main compartment features ports at the back that allows your hydration hose out. The Catalyst backpack is strategically designed to host your ice ax and trekking poles when not in use. It comes with two loops at the bottom of the exterior mesh pocket. Fasten your ice ax in place using the top Velcro straps. 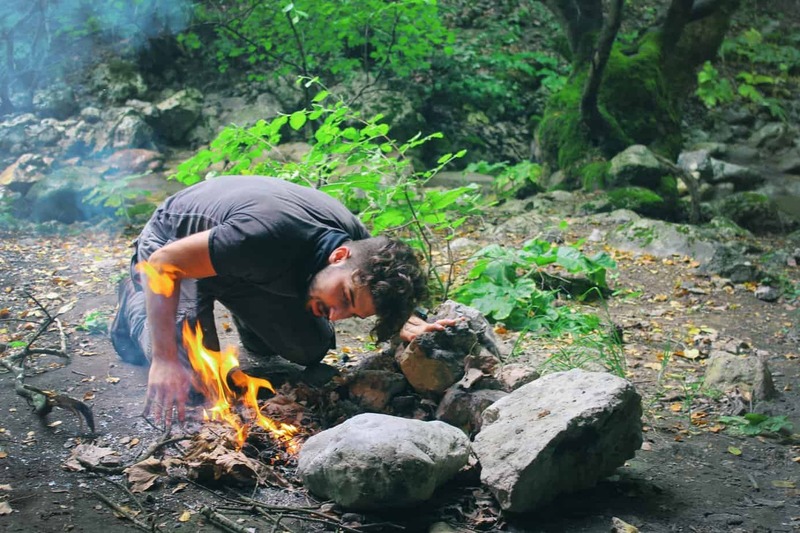 The strength of your backpack lies in its construction. If poorly built, it won’t hold under much pressure. Heavily constructed packs also tend to wear you out. They add to your base weight. The Catalyst, however, is solidly built in an ultralight package. It’s intended for the long distance hiker. Just like other ULA packs, the Catalyst features the iconic 210 Robic Fabric. Its Multicam Camo pack is the only exception that adorns of 500 Cordura Fabric. Both materials are rainproof and tear resistant. The backpack’s frame, hip belt, and shoulder straps are made of a cushy spacer mesh. However, when off-trail it tends to collect debris like pine or spruce needles. This backpack is available in a variety of colors; green (original), red, black, purple blaze and orange. With its streamlined design, your gear stays intact, so you don’t end up looking like a yard sell on the track. The ULA Catalyst is all functional minus unnecessary fluff. 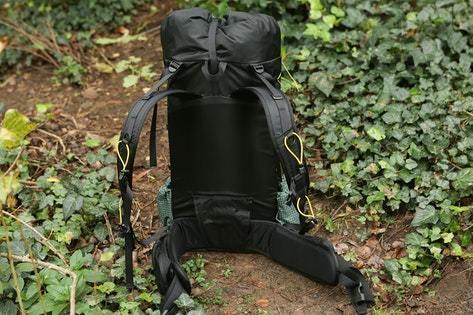 As a high capacity backpack, it is intended for serious hikers with lots of loads to carry along the way. It guarantees unmatched comfort and durability even in the toughest trails. With its numerous capabilities, you can fine-tune the pack to your fit. Simply select from their wide array of torso length, shoulder straps, and hip belt sizes. 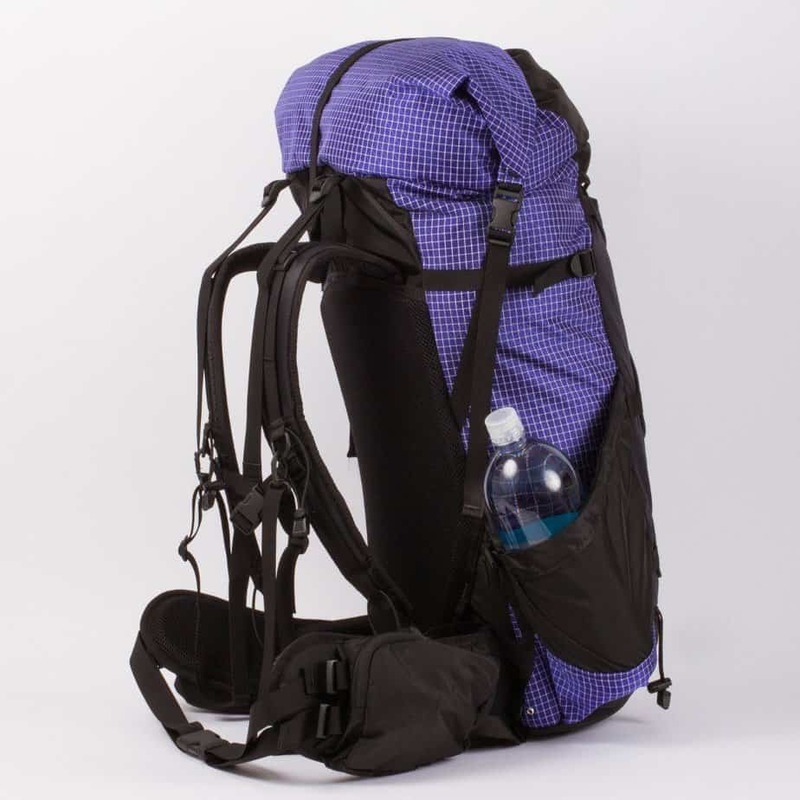 If you find the Catalyst too large for your 3-4day hike, try ULA 68liter Circuit backpack. It highlights all the features of the Catalyst in a smaller pack. The Circuit is also better sized to reduce your pack load and volume significantly. You can buy your ULA Catalyst backpack from ULA Equipment. Your base weight is the total weight of your entire luggage. It includes food and water containers minus their contents. Knowing your base weight helps you decide on which suspension system is best to handle your load on the track. Finding the right torso length is crucial if you want a proper fit. If you don’t know it by heart, take a measuring string and tilt your neck to your chin. Touch the largest bone on your neck. From this point begins to measure along your spinal curve till you reach your hipbone. For an accurate reading, its best to have help. Unlike your hip belt, if you find your torso length is between pack sizes go for the smaller size. Measure your waist size and add two inches. The summed up size equals the hip belt size you required. Most women tend to have narrow waists and larger hip size. When buying, we recommend you at 5inches to your actual waist size. The summed size should be the perfect fit for your hip belt. However, if your hips are small, try adding 3inches to your actual waist size for the correct hip belt size. Note: If you are on the edge of a size range, buy a size up. For instance, if your summed up size is 38inches (the highest size in the medium range) its best to buy from the Large hip belt range as it is the first size in that class. As mentioned earlier, the Catalyst backpack features two types of shoulder straps: J-shape and S-shape. Both are intended for a different audience. Follow the above-mentioned guidelines on how to choose the right shoulder strap for an effective backpacking experience. ULA offers you a variety of backpack colors for your liking. You can choose the original green or go for a more customized fit. Either way, the company is flexible around your edges.